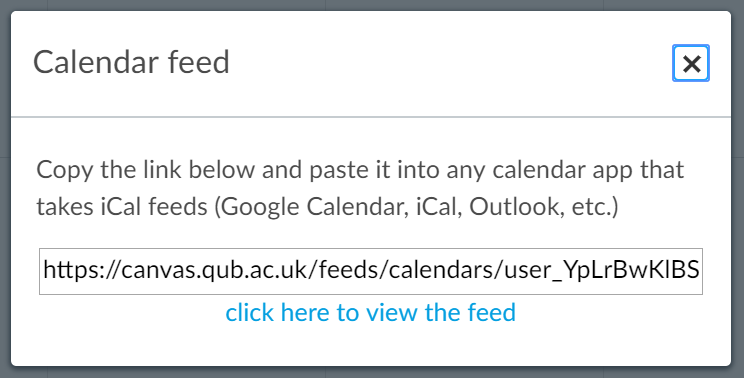 How can I email all students directly to their QUB email? The ’email all students’ function is done in Qsis, not Canvas, depending on the permissions of the staff member. In Qsis, open the Class Roster. Select the option to email an individual student or a group of students. To email an individual student: Click on their Name and a message will open in your own email account. To email a group of students: Click the Select All link. You can then un-tick those you do not want to notify. a) Click the Notify Selected Students button and the Send Notification screen will open. b) Your email will be in both the From and To fields, this ensures you get a copy of any sent emails. c) The students selected will be in the BCC field. d) You may wish to add other staff to the CC field. e) The default subject can be changed. f) You can also spell check the message using the book icon. g) When ready, click the Send Notification button. More Information: Please see page 3 of this guide. How do I add video, slides and/or audio content to my Canvas course from Mediasite? Mediasite is a video streaming platform, which is fully supported by Information Services and integrates directly with Canvas. It allows staff to record, upload and share recorded lectures, seminars, events and other video and audio content. In Canvas these various types media can be incorporated into your course without taking up any of your allotted Canvas storage. How can I view/print a module roster of student photographs? a) Go to ‘Reporting Tools’ then ‘Query Report Viewer’ under BI Publisher. b) Type in QUB_MOD_IMG in the ‘begins with’ field then click search. c) Click on view report then enter the module information and click ok.
School staff would also be able to access student photos in the ‘Student Images by Plan’ report and ‘Bulk Photos’ under Records and Enrolment. More information on Qsis for school administrative staff is available here. Step 6 in this guide highlights the option to include photos in the roster. You can view 1 or 100 students at a time via the ‘view 100’ button at the top of the list. Email addresses are not displayed in the list/table but can be viewed when you click in to the student. More information on Qsis for Academics is available here. Can I still access modules in the Queen’s Online VLE? Modules that are available in Canvas, will not be available in the Queen’s Online Virtual Learning Environment (QOL VLE). Previous QOL VLE modules and materials will still be accessible in the QOL VLE. Modules for AY 2019/20 which are available in Canvas, will not be accessible in the QOL VLE. Note: Only the ‘Modules/Learning Home’ of Queen’s Online is being replaced by Canvas. All other areas of Queen’s Online, where you can access other online resources and services will remain the same. What are the Canvas Roles? Observer: Access to view learning materials, discussions and announcements. This role is unable to participate in any of the activities, build content, view grades or view student and module statistics or reports. External Examiner: View only access role, to view announcements, discussions and all grades. This role is unable to participate in any of the activities, build content, grade or view student and module statistics or reports. Course Designer:  This role has access to view materials, discussions and announcements. Course Designers can also build learning content (collaborations, discussions, outcomes and rubrics) and have the ability to publish and extend module/activity dates. This role does not have the ability to grade or view student and module statistics or reports. Teaching Assistant: This role can view and build learning content, collaborate with students and grade submissions. This role does not have the ability to view student and module statistics and reports. Teacher:  This role can view and build learning content, collaborate with students and grade submissions. This role also has the ability to view student and module statistics and reports. Note: Canvas roles are not related to job titles and should be set based on level of permission required. Note: In line with Data Protection requirements, Canvas must protect the privacy rights of individuals when processing data. Those responsible for assigning Canvas roles, should remember that data being accessed by staff members must be limited to what is necessary for their role. For more information on GDPR please click here. I can’t create or open a collaboration – what should I do? To create, view or interact with Office 365 content, you and your students will first need to login to Office 365 through the link in the Canvas course navigation menu. a) Go to the main module home page, click office 365 in the course navigation menu on the left, your office 365 files should then appear. b) Click log out on the right-hand side. Once logged out, sign back in, by clicking log in (you may have to enter your sign in credentials again). c) Once you have logged back into office 365, navigate back to the collaborations section and create the collaboration. If the error persists try deleting your browser cache/history and cookies (see guides for all supported browsers here: Mac or PC) then repeat step 2. Please check that the user attempting to open the collaboration has been added as a collaborator. If the user has been added to the collaboration and the error persists, please log out and back in to Office 365 within Canvas, by completing step 2 above. Note: Please ensure that you are not signed in to different Office 365 accounts (staff/student/personal etc) even if using separate browsers, as this can cause issues with linking to the correct Office 365 account. Canvas Guide: How do I create a Microsoft Office 365 collaboration as an instructor? How do I import content into my Academic module from my module development area? Go into your Academic module then click on ‘Settings’ at the bottom of the module navigation menu and click on ‘Import Course Content’ on the right-hand side (See Fig.1). Select ‘Copy a Canvas course’ then search for your development module (it will have ‘DEVELOP’ at the start of the title) and select it (See Fig.2). Once your development module has been selected click on ‘All content’ then import. You can click on ‘Select specific content’ if you do not want to copy over all content (See Fig.3). The job will be queued under ‘Course copy’ and should take just a few moments to complete, depending on the amount of course content involved (See Fig.4). Navigate to different areas of the Academic module to confirm the content has been imported. Some settings and content are not included in the course import and will require re-activation/re-insertion in the module. The links below provide more information on the items that are not included and how to use the course copy/import tool. The above steps and further information is available in the Canvas – getting ready to go live guide. How do I copy content from another Canvas course using the Course Import tool? What do I do if I run out of storage space in my Canvas module? If you require additional storage on your Canvas module, please contact the Digital Learning Solutions team from the ‘Help’ menu in Canvas. What is my module storage allowance in Canvas? Can I stop students seeing assignment feedback before moderation? Yes, it is possible to change the settings within the Gradebook or Speedgrader to stop feedback being seen by students before you are ready. In Canvas this is called ‘muting’ an assignment. If you create an anonymous assignment, Canvas will automatically ‘mute’ the assignment. If the assignment is not anonymous, you will need to ‘mute’ the assignment in the Gradebook or in the Speedgrader. The link below will bring you to a guide that shows how to mute and unmute assignments. Note: if you are using Turnitin Feedback Studio to mark students’ assignments, you must set the ‘Feedback Release Date’ to a date and time that you want your students to receive their grades and feedback. Can I import content from a Moodle course into Canvas? Yes. However it is important to note that some of the activity/resource types in Moodle do not exist in Canvas, and this will impact on how some of the Moodle course materials appear in Canvas. 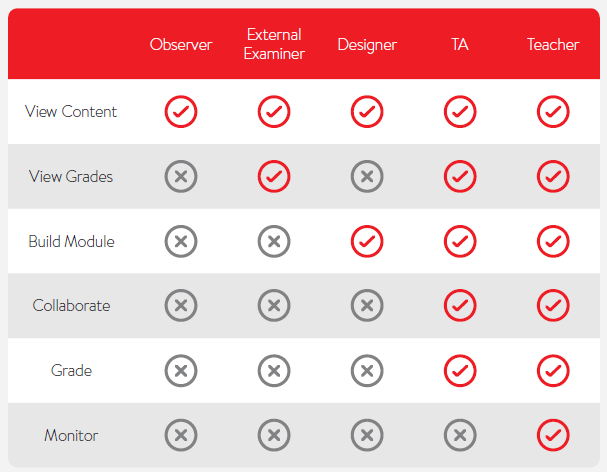 The table below shows some of the activities/resources in Moodle which do not exist in Canvas and explains how they will be imported (based on Moodle version 3.0). Advice: It is advised that you make an audit of your Moodle course before importing, and make a note of the features listed in the table below. What happens when imported to Canvas? Glossary Will import as a Canvas Page, but the terms and definitions will not display. Label Will import as a Canvas Page, but the layout and details of the text in the page may need to be reformatted or reorganised. Lesson Will import as a series of Canvas Pages, but the connections between pages will be lost. Question banks Canvas will not import Moodle question banks on their own, but question banks can be imported if you choose to also export the Moodle quiz they’re associated with. Most question types within Moodle will be imported into Canvas with no problems. However, those question types mentioned in the cell to the left will not import. Follow the instructions on how to create and save the back up (Note: Make sure you do not include the enrolled users in your back-up file). 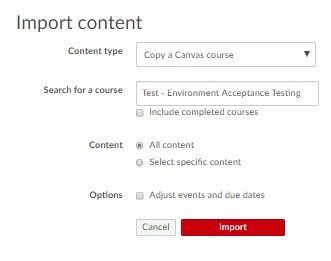 Then you can log in to Canvas and import the contents of your Moodle course into your Canvas course. If I change a question in my question bank will it automatically update the quiz? If you add questions to a quiz using the ‘New Question Group’ function, then changes in the question bank will be reflected in the quiz. However, if you add a question using the ‘Find Questions’ function, this creates a copy of the question from the bank in its current form. Any changes to the question in the bank will NOT be reflected in the quiz from that point on. How can I tell if an assignment has been submitted late? Any late submissions will show up in the Grades as red. In the Speedgrader you can also see if an assignment is submitted late. Can you add ‘comment banks’ to Speedgrader? Comment bank functionality is not available in Speedgrader. However there are many other options in Speedgrader that help you to provide feedback in an efficient way, including the use of rubrics and a speech-to-text feature for leaving feedback. How can I find out the number of students in my course? QSIS: Enrolment and registration first takes place in Qsis and then this information flows through to Canvas. Canvas: In Canvas you can check the student enrolment information by clicking on People in your course navigation menu. Clicking on the All roles dropdown will show you each Canvas role in your course, with the number of active users beside each role (See Fig. 1). Contact your School Administrator and ask them to confirm with Qsis, the number of students in your course, or alternatively, contact the QSIS Support Team. Canvas Guide: How do I use the People page in a course as an instructor? Only half of the module name is appearing in the Canvas course title, how can I change this? Module Names in Qsis: Information in Canvas, (including module name/course title) flows through from Qsis. There is a 30 character limit in Qsis for a course title (short name), anything above this will not be included. Course Titles in Canvas: To change your Canvas course title and reduce the number of characters, please contact QSIS Support Team and amend to 30 characters or less (including spaces & punctuation). Once complete in Qsis, the new course title will automatically flow through to Canvas in 24-48 hours. How can I change my name as it displays on Canvas? Display Name: Displays in areas where you are collaborating. (e.g.) Discussions, Messages and Comments. Full Name: Appears in some areas in Canvas. (e.g.) Gradebook, Chat, EPortfolio and integrated applications such as Office365 or TurnItIn UK. How to change your Display Name: Submit a ticket via the Help button in Canvas. How to change your Full Name: If your Full Name has legally changed and needs to be updated in Canvas, you will need to change it in Qsis first. Please contact the QSIS Support Team directly. Once this is complete, it will automatically update in Canvas in 24-48 hours. By default, each Canvas Course has 500 MB of storage space. How to check your storage limits. Click Settings, click File Storage tab. For more information, please check out the Canvas guides. Can I ensure that students receive email notifications about Announcements in Canvas? No. It is not possible to ensure that all your students receive email notifications about Announcements in Canvas. Notification Settings: Students are able to customise their Notification settings in the same way that staff members can and can choose to turn off the notifications for Announcements. However, even if they turn this notification off, they will still see the Announcement when they login to Canvas. Advice: If you are planning to use Announcements to communicate information about your course, advise your students to keep this notification turned on. Canvas Guide: How do I set my Canvas notification preferences as a student? Our School has particular requirements for specialist Apps. Will these be available in Canvas? Feature Request process: This process is available to enable you to request additional features or educational apps within Canvas. The list of current apps and information on how to request new apps is outlined below. Current Apps: These plugins are currently available in Canvas: Turnitin UK, Office 365, Mediasite, You Tube, Wikipedia, Vimeo and Twitter. New Apps: If you would like additional educational apps integrated with Canvas, please submit a ‘Feature Request’ ticket via the Help button. Your request will go through a series of checks by the Systems Support Team before its ‘potential’ approval. 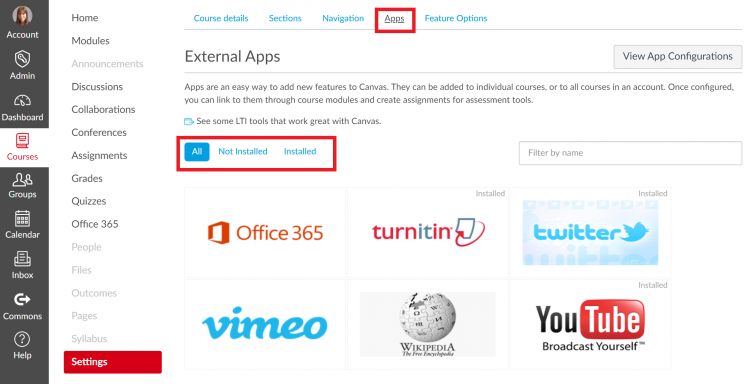 Adding Apps into your Canvas Course: In your live course, click Settings, then click the Apps Tab. You can filter by all, not installed or installed. Simply click the App you want then click Add App. Once added, some apps are available to you within the Rich Content Editor. (via a drop down list icon). Canvas Guide: How do I use the Canvas App Center in a course? Will I continue to use QuestionMark or can I use Canvas now? Canvas has a Quizzes feature that can be used for formative assessment. However, until we pilot the use of Canvas Quizzes for summative assessment, we advise that you continue to use Questionmark (you can link to it from your Canvas course if necessary). Can you see all your student grades and assignments within Canvas? Yes. You can use the Gradebook feature to do this. The link below will bring you to a Canvas guide that explains how to use the Gradebook. Can you use Canvas for peer review? Yes. You can set up peer review assignments for students in Canvas. Students can then leave written and/or audio feedback for their peers. When will Canvas be available to the whole University? Canvas is being implemented across the university in phases. All Undergraduate and Postgraduate Taught modules will be on Canvas in the academic year 2019/20. Can you set up release dates for various types of content? Date and time release functions: These are available for ‘Canvas Modules’ (i.e. weeks/topics settings) and other features such as assignments, quizzes, discussions and announcements. The guide below explains how to edit a module’s settings to lock all content and release it on a particular date/time. Canvas Guide: How do I lock a module? When creating groups for student activities, can you identify a student group lead and sort groups by a number of criteria? Yes. You can identify a student lead and move students from one group to another via drag and drop or randomly allocate them to groups. The link below will bring you to the Canvas guide on how to assign a leader to a group. Will Canvas show students their individual timetables? No. Timetable integration with Canvas is not available at this time. Can you export the Canvas Calendar into other online calendars such as Google calendar? Canvas Calendar Export: It is possible to export the Canvas Calendar into other online calendars. However, Canvas will not automatically update your other calendar if you make changes within Canvas. External Calendars Import: It is not possible to import other external online calendars into the Canvas Calendar. Canvas Guide: How do I view the Calendar iCal feed to subscribe to an external calendar as an instructor? Will academics have access to a ‘sandbox space’ in Canvas? Familiarisation Areas: These are available so that academics can experiment with the various features and tools available. This is your own personal space, no other academics or students are enrolled in this area. Test Student: You have access to a ‘test student’ via the ‘student view’ feature. This will let you view and interact with your module content to test what it is like from the student perspective. To access the student view feature, click Settings then click Student View on the right hand menu. Note: The ‘test student’ feature can be used for most functionality in Canvas and can be reset as required. Canvas Guide: How do I view a course as a test student using Student View? Is Canvas purely an academic tool or can it be used for pastoral care? Canvas is a Virtual Learning Environment (VLE) for facilitating learning and teaching. Current processes for pastoral care will continue. Can Canvas be used as a tool for mass communications with all students? No. Canvas is a Virtual Learning Environment (VLE) for facilitating learning and teaching. We have other tools available within the University for this purpose. Will non-academic courses be available on Canvas? At this time, the initial focus of the roll-out will be on credit-bearing academic modules whose enrolments come through QSIS, our student record system. However, we are aware of this requirement and will be investigating this further in the future.